I don't own a bumpfire or really even care about them, but I get so sick and tired of them desparately clutching at any thing they can to take nibbles out of 2A rights. It is especially disgusting when they exploit American's deaths to do it. Right after the attack in Las Vegas Hillary was saying that it's a reason to kill the hearing protection act... wth does that have to do with anything? Now all kinds of politicians are calling for a ban on bumpfire AND THE NRA IS OPEN TO COMPROMISING ON IT!?!?!? 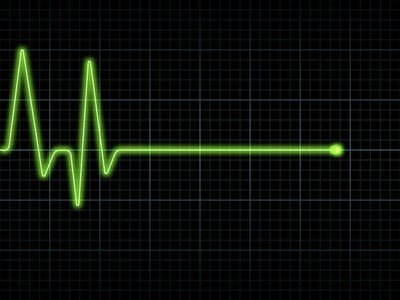 Re: Are they going to ban bump stocks now? the BATFE clearly defines semi-automatic fire as trigger pull equals one shot. The bump stock doesn't change anything about that definition. And I have heard some people fire a normal semiauto with a really good trigger and trigger control that sounds almost like automatic fire too! So they are going to regulate how fast you can possible pull the trigger? They already opened their mouth, stuck their foot in, and then rammed their head up their a$$ with the first statement. Now this statement says that they oppose THIS BILL but I don't see anything about a real change of opinion. I think it's time to give a lot of the NRA board their walking papers and bring in new board members that will actually "STAND AND FIGHT" for 2A rights. That's why I don't understand so many people walking away from their memberships. Be a voting member and vote for a board that stands for what you want! "We are opposed to the Feinstein and Curbelo legislation," Jennifer Baker, a spokesperson for the NRA's Institute for Legislative Action, told the Washington Free Beacon. I'm tired of being sold out by the groups and politicians that are supposed to be serving us and standing up for the constitution. All they said was that they oppose that one bill because it goes too far/is too broad. They already said that they want "devices designed to allow semi-automatic rifles to function like fully-automatic rifles should be subject to additional regulations". If they want to go back to being (or staying) the NRA that is about protecting peoples deer rifles and bird guns then screw them. The restrictions on automatic firearms are already unconstitutional and should have been undone with the Miller case in the 30s. Does the NRA want to protect the 2nd amendment or not? I can't tell wha they're up to anymore. It almost seems like someone is lobbying them or they're trying to find a "middle " ground just like this bum rinos in Congress on everything they campaigned on. Or maybe it's Russia's fault? Re: Are they going to ban bump stocks now? - MA did! Massachusetts just signed their budget bill into effect and it had a bumpstock ban built into it. With a mandatory 18 month sentence with up to LIFE IN PRISON for owning an accessory that was legal yesterday morning! I guess in 90 days they start treating bump stocks and trigger cranks like machine guns, which are a big no-no in MA. It'd be easy to say that the Massholes are getting the government they deserve, but the dirty politicians that do this crap are everywhere. Who will be next? Colorado, Nevada, Washington? Wow. Sad for the the birthplace of the American Revolution to stomp on rights like this. People around here have been selling them for 5-600 for the last month. The ATF is taking comments up to January 25th on pending regulations that could ban bump stocks. Submit your comments to OPPOSE NEW REGULATIONS ON BUMPSTOCKS now. 1. BUMP STOCKS DO NOT FALL WITHIN THE DEFINITION OF “MACHINE GUN” UNDER THE NFA. The Obama administration was correct when, in 2010, it determined that bump stocks did not convert semi-autos into fully automatic firearms. According to this definition, a “bump stock” does not fall within this definition. With a “bump stock,” each and every round is discharged as the result of an independent pull of the trigger. So it is simply untrue that the “bump stock” assists the discharge of more than one round “by a single function of the trigger” -- no matter how fast the gun discharges rounds. One pull, one discharge. This is the classic textbook definition of a SEMI-automatic firearm. 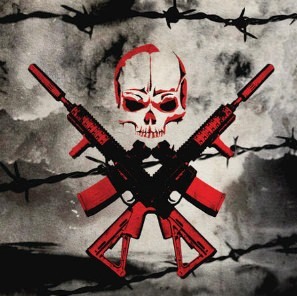 If the ATF were to illegitimately use a standard based on “increasing the rate of fire” to ban or regulate bump stocks, then what is to stop it from illegitimately holding that other rate-increasing devices -- like belt loops, sticks or fingers -- are “machineguns” as well? YouTube abounds with examples of people using these items to increase the rate of fire of their semi-autos. 2. ATF HAS NO CONSTITUTIONAL OR LEGAL AUTHORITY TO BAN OR REGULATE BUMP STOCKS. The ATF's statutory authority, contained at 6 U.S.C. 531, is very narrow. Nowhere does federal law give ATF the general authority to regulate the safety of firearms, accessories, or parts. This is important, because, if federal law did do this, then it could administratively ban semi-automatics, or handguns, or all guns. Constitutionally, the Second Amendment says the right of the people to keep and bear arms “shall not be infringed.” Our rights are not privileges from the government that can be revoked or regulated at will. And regulating or banning bump stocks would serve as unconstitutional infringements. Press secretary said at the briefing today that they are "looking into options about how to regulate bumpstocks" after they were used in Las Vegas. Funny how that's one of the only things (or at least that we're told from the leaked crime scene photos) about the whole Vegas attack. Only 100,000 comments in a month? I would have thought it would be more. On that note, I think and hope, this a show to make the point there’s nothing illegal about these accessories and never has been. Maybe we will even get the chance to educate some people about the ridiculous BATFE rules and get some changes there. Essex Police Chief Peter Silva held up a bump stock that someone turned in this week as the Massachusetts ban on the devices went into effect. “To my knowledge, this is the only one that’s been turned in to date,” he said. State Police said they received three bump stocks and one trigger crank, as Massachusetts now becomes the first state in the country to make the devices illegal. John Rosenthal, who heads up the group Stop Handgun Violence, lobbied for the ban. “There’s no question in my mind that people won’t turn them in,” he said. How many complied with Denver police notice to surrender bump stocks? Not one! That’s how many gun owners accepted an invitation from the Denver Police Department to surrender bump stocks, Denverite reported. The device increases the rate of fire for semi-automatic weapons to nearly that of fully-automatic firearms. Good. I'm glad people in Mass. and Colo. aren't turning in their legally purchased accessories. Let them come for them. Maybe we'll see a case that gets fought up to the supreme court. Maybe we'll win it. Maybe they'll kick in doors to "come and take them". Despite the picture of people lined up to turn in their guns in Conn. last I heard it was "only" about 15% compliance. Or maybe they'll just keep passing "little" infringement laws like this until only a handful of people have guns and they're all buried in the yard or rusting away inside walls not doing any good. Now... where are the NRA and other groups to stand up and fight these laws? 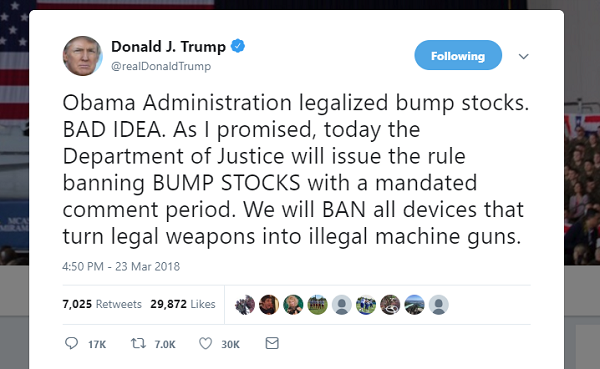 Donald Trump: "Obama Administration legalized bump stocks. BAD IDEA. As I promised, today the Department of Justice will issue the rule banning BUMP STOCKS with a mandated comment period. We will BAN all devices that turn legal weapons into illegal machine guns." 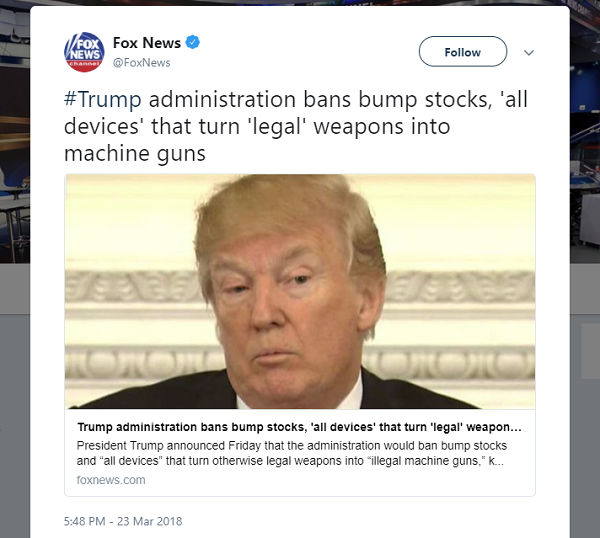 Fox News: "#Trump administration bans bump stocks, 'all devices' that turn 'legal' weapons into machine guns"
AG Sessions has issued the NPRM to classify bumpstocks as machineguns and regulate them via the NFA. 1. The authority citation for 27 CFR part 447 continues to read as follows: Authority: 22 U.S.c. 2778, E.O. 13637,78 FR 16129 (Mar. 8, 2013). Machinegun. A "machinegun", "machine pi stol", "submachinegun", or "automatic rifle" is a weapon which shoots, is designed to shoot, or can be readily restored to shoot, automatically more than one shot, without manual reloading, by a single function of the trigger. 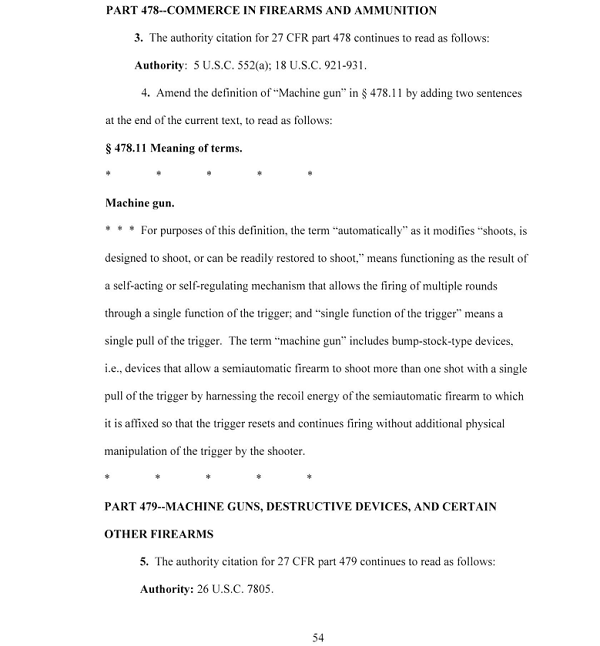 The term shall also include the frame or receiver of any such weapon, any part designed and intended solely and exclusively, or combination of parts designed and intended, for use in convelting a weapon into a machinegun, and any combination of parts from which a machinegun can be assembled if such parts are in the possession or under the control ofa person. For purposes of this definition, the term "automatically" as it modifies "shoots, is designed to shoot, or can be readily restored to shoot," means functioning as the result of a self-acting or se lf-regulating mechanism that allows the firing of multiple rounds through a single function of the trigger; and "single function of the trigger" means a single pull of the trigger. The term "machinegun" includes bumpstock-type devices, i.e., devices that allow a semiautomatic firearm to shoot more than one shot with a single pull of the trigger by harnessing the recoil energy of the semiautomatic firearm to which it is affixed so that the trigger resets and continues firing without additional physical manipulation of the trigger by the shooter. 3. The authority citation for 27 CFR part 478 continues to read as follows: Authority: 5 U.S.c. 552(a); 18 U.S.c. 921-931. 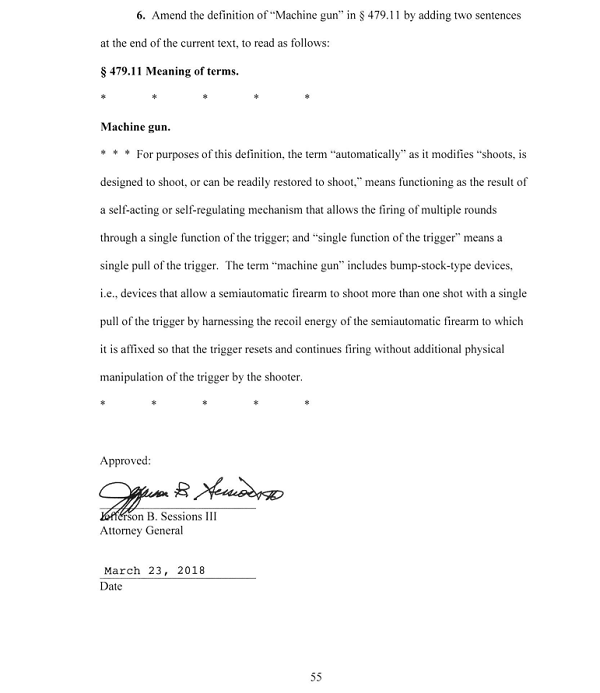 For purposes of this definition, the term "automatically" as it modifies "shoots, is designed to shoot, or can be readily restored to shoot," means functioning as the result of a self-acting or self-regu lating mechanism that allows the firing of multiple rounds through a single function of the trigger; and "single function of the trigger" means a single pull of the trigger. 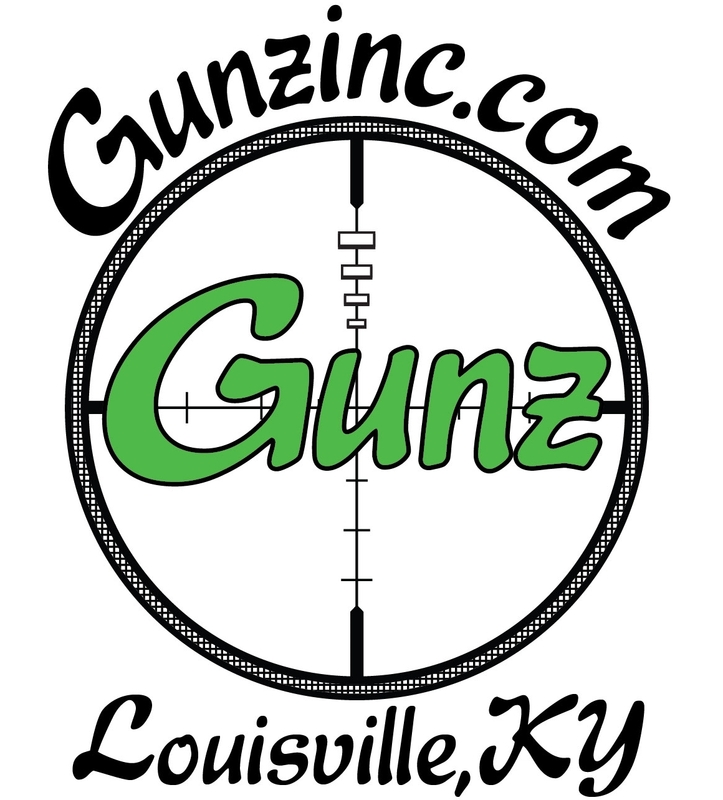 The term "machine gun" includes bump-stock-type devices, i.e., devices that allow a semiautomatic firearm to shoot more than one shot with a single pull of the trigger by harnessing the recoil energy of the semiautomatic firearm to which it is affixed so that the trigger resets and continues firing without additional physical manipulation of the trigger by the shooter. 5. The authority citation for 27 CFR part 479 continues to read as follows: Authority: 26 U.S.c. 7805 . For purposes of this definition, the term "automatically" as it modifies "shoots, is designed to shoot, or can be readily restored to shoot," means functioning as the result of a self-acting or se lf-regulating mechanism that allows the firing of multiple rounds through a single function of the trigger; and "single function of the trigger" means a single pull of the trigger. The term "machine gun" includes bump-stock-type devices, i. e., devices that allow a semiautomatic fi rearm to shoot more than one shot with a single pull of the trigger by harnessing the recoil energy of the semiautomatic firearm to which it is affixed so that the trigger resets and continues firing without additional physical manipulation of the trigger by the shooter. Great it looks like the NRA and DJT and the gun grabbers got what they wanted. This is crazy. What else will it cover? Echo and taccon triggers? Cranks? Fast fingers? 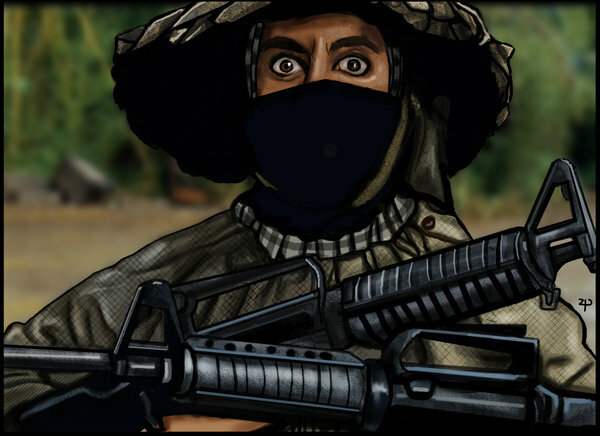 Machinegun. A "machinegun", "machine pistol", "submachinegun", or "automatic rifle" is a weapon which shoots, is designed to shoot, or can be readily restored to shoot, automatically more than one shot, without manual reloading, by a single function of the trigger. 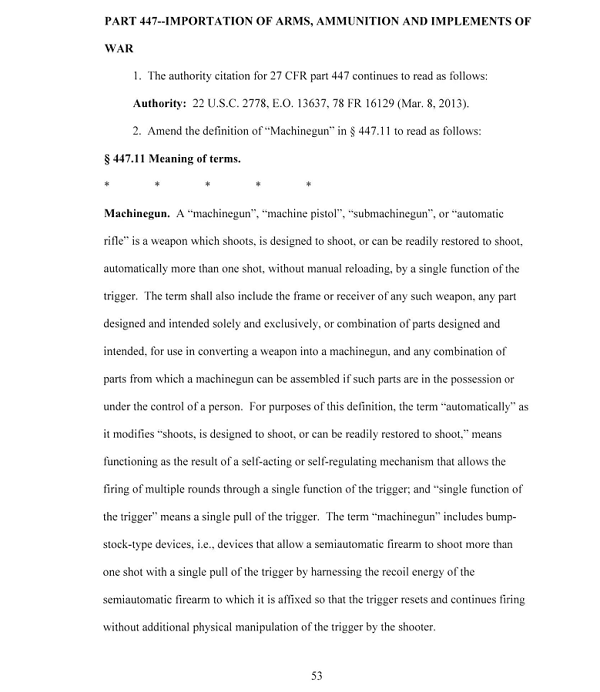 The term shall also include the frame or receiver of any such weapon, any part designed and intended solely and exclusively, or combination of parts designed and intended, for use in convelting a weapon into a machinegun, and any combination of parts from which a machinegun can be assembled if such parts are in the possession or under the control of a person. For purposes of this definition, the term "automatically" ... means functioning as the result of a self-acting or self-regulating mechanism that allows the firing of multiple rounds through a single function of the trigger; and "single function of the trigger" means a single pull of the trigger. The term "machinegun" includes bumpstock-type devices, i.e., devices that allow a semiautomatic firearm to shoot more than one shot with a single pull of the trigger by harnessing the recoil energy of the semiautomatic firearm to which it is affixed so that the trigger resets and continues firing without additional physical manipulation of the trigger by the shooter. The echo triggers can fire two rounds with one "pull" even though there are two "functions"